Increasing driving efficiency of an automotive drive axle. How to reduce cost of an automotive drive axle ring gear for 50%. Hypoid gears are common in automotive drive axles. Because of the low driving efficiency of the hypoid gear the fuel economy of cars and trucks is reduced by 4%-6%. Heavy trucks usually have higher ratio in the hypoid gear drive, and the loss of the fuel economy is higher. 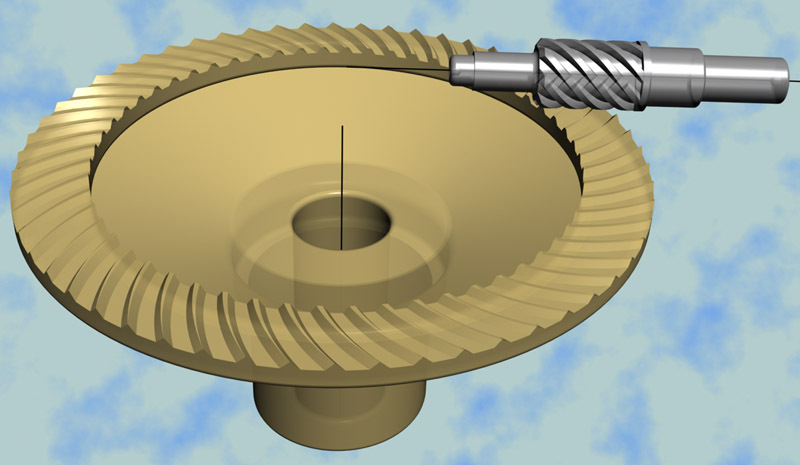 Spiral bevel gear is a high efficiency alternative for a hypoid gear. The driving efficiency of a spiral bevel gear is 99%, The driving efficiency of an automotive hypoid gear is 92%-96%. Unfortunately the spiral bevel gear can not replace a hypoid gear in an automotive drive axle because it can not transmit as much of torque as a hypoid gear. The hypoid gear drive consumes from 4% to 6% of engine power. The high portion of the engine power transforms to heat and never gets to the wheels. For example, with 800 h.p. engine-power 48 h.p. may be lost on drive axle hypoid gear. Improving the driving efficiency of the hypoid gear for 4% could provide extra 32 h.p. Hypoid gears are very expensive gears in manufacturing. A tooth cutting machine from Gleasson, Modul or Oerlikon may cost $2,000,000.00 or more. A tooth geometry and contact pattern inspection machine cost another $2,000,000.00. An expensive $200,000.00 software is required for design and manufacturing of hypoid gears. In addition to the expensive machines the manufacturing also requires a very expensive tooth cutting tools, that cost about $10,000.00 for gear and another $10,000.00 for pinion. Each tool holds up to 24 cutter blades for $100.00 each. Add also cost of long cutting generating process 3-10 minutes for each part, and tooth contact pattern development time that may require a number of iterations. There is more cost involved. The labor cost is normally 20% higher in hypoid design and manufacturing because of the complicity. The use of hypoid gears in a final product adds significant cost as well. The gears are very sensitive for positioning and deflections. The gear box needs to have more expensive design to reduce deflections. It also needs extra time in assembly to align the gears for a correct contact pattern. The current development of hybrid vehicles requires high back driving efficiency of the drive axle. The back driving efficiency of the hypoid gear is as low as 81% -86%. It means that about 15% of power can not be saved back to batteries when a hybrid car reduces speed or goes down slope. When driving in heavy traffic the hybrid car may loose up to 10% of fuel only because of the hypoid gear. The picture below shows an alternative gear design that has advantages versus a hypoid gear. This gear set is a modification of a worm face gear specifically designed for replacing of a low efficiency hypoid gear in automotive drive axle. The fist experiments of using a worm face gear on cars were conducted in Russia in 1968. 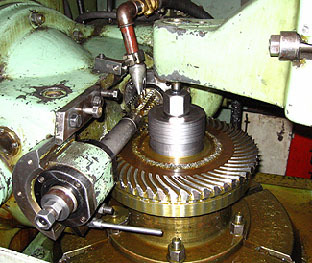 The worm face gear was installed in the same gear box on a stock car Moskvich 401, manufactured at AZLK factory in Moscow. The project was targeted on cost reduction, simplicity of assembly and repair. 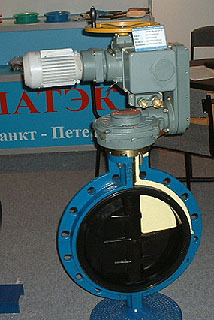 The gear prototypes were manufactured in Izhevsk and successfully tested on other applications. However the new promising development did not go to the production. 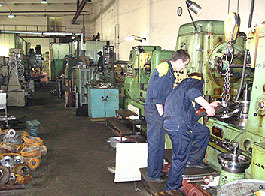 The automotive company purchased a new production line from Oerlikon to make hypoid gears for Moskvich 2140 and 2141. The very promising project was successfully forgotten until today’s high demand of for more fuel efficient and less expensive cars. Below is a brief description of advantages of the automotive drive axle worm face gear. 2%- 4% increase of the driving efficiency means saving 2%-4% of fuel and 2%-4% increase of power output. 4%-6% increase of back driving efficiency means extra fuel saving for hybrid and electric powered cars. 2 Db of noise reduction because of higher tooth contact ratio means more comfortable driving conditions on luxury cars. 50% of overall saving in design, product development and manufacturing because of: lower cost of gear cutting machines, easy inspection methods and shorter tooth cutting time. The cost of the pinion production can be reduced for 90% because it can be made by whirling method. Unlike hypoid gears the new drive axle gear and pinion do not need to be produced in sets. Every pinion can be used with any gear. The gear and the pinion can be manufactured on different equipment in different countries. The assembly and replacement is simple. 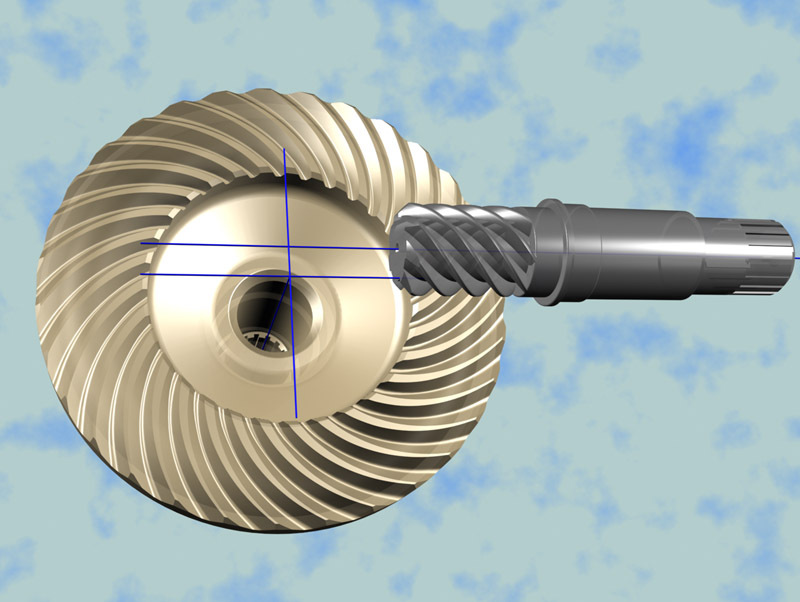 The pinion is not sensitive for its axial location. 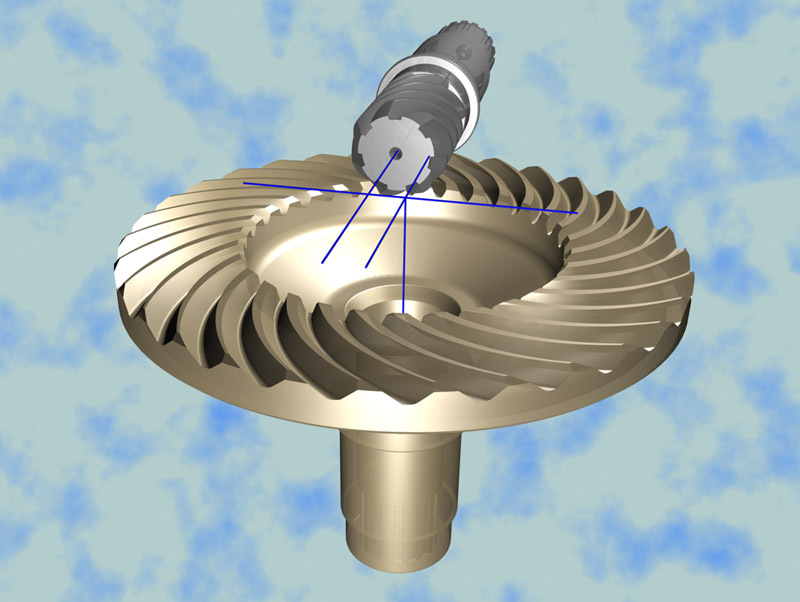 The same pinion geometry can be used with different gears. 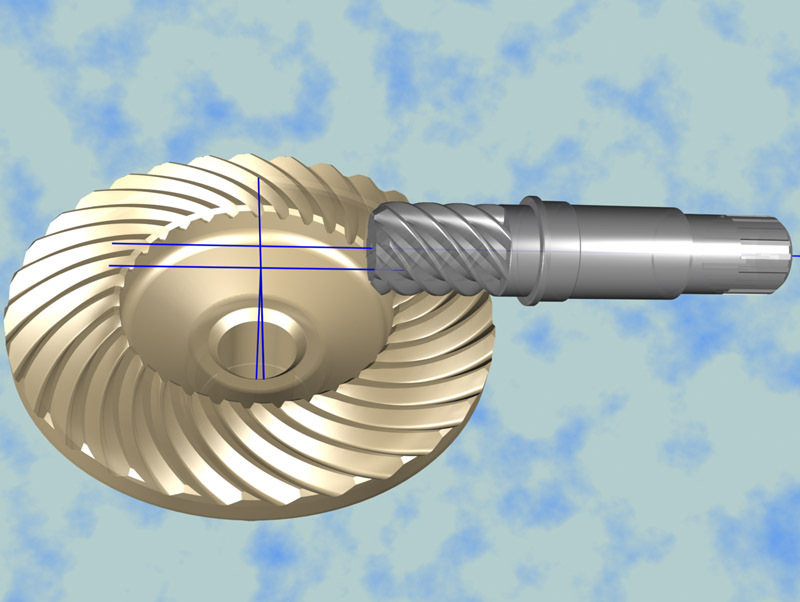 The CAD model on the picture below has the same pinion meshing with a ring gear, which has more teeth. They are widly used for oil pipelines electromechanical rotary actuators. Because of low rotational speed, grinding the tooth surface of the gear is not required. However, for high performance automotive application a high productive ZAKGEAR continues grinding process can be developed with help of Direct Digital Simulation method. With ZAKGEAR CBN plated honning tool the ring gears can be produced on a standard spur gear continues grinding machine. With ZAKGEAR continues grinding process of a worm face gear can be produced by grinding out of a solid blank without of use of a hob cutter. ZAKGEAR continues grinding process should be considered as honning because of the possibility to achieve a very high production quality on case hardened ring gears. The same ZAKGEAR grinding/honning tool is universal and it can be used for production of different ring gears with different number of teeth.